2051. 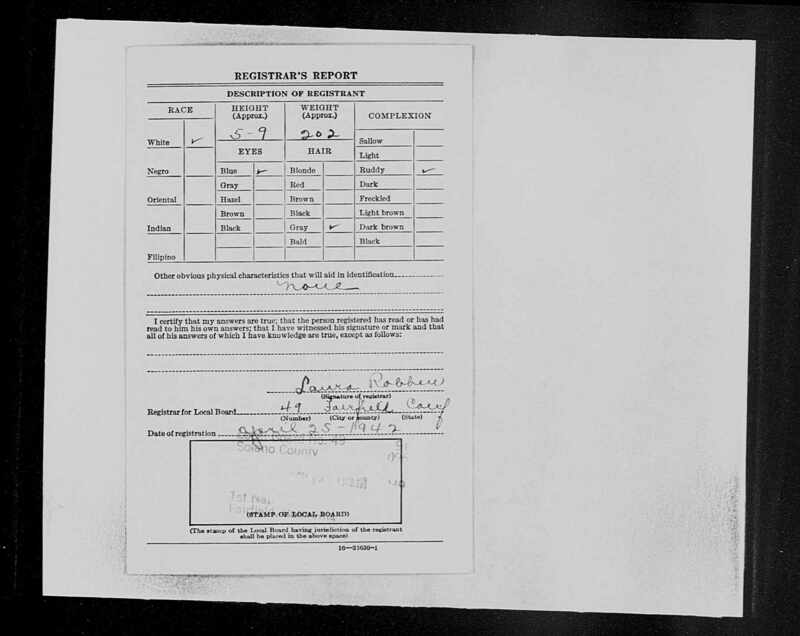 Leroy M Sutter, “Florida, Death Index, 1877-1998,” September 14, 1978, Orange County, FL, USA, https://familysearch.org/pal:/MM9.1.1/VVVX-Z2B. 2052. 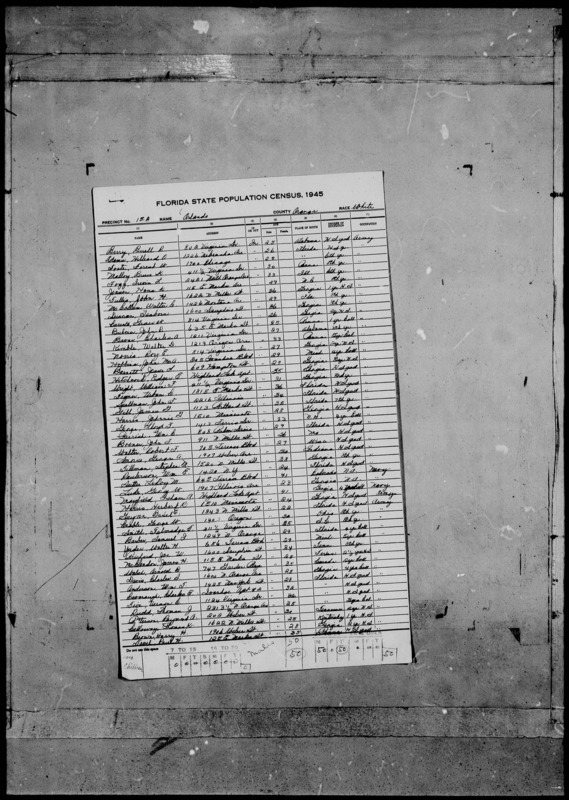 “Florida, State Census,” 1945, FL, Orange, Orlando, Precinct 16, 51, 227, https://familysearch.org/pal:/MM9.1.1/MNFR-HLN. 2053. 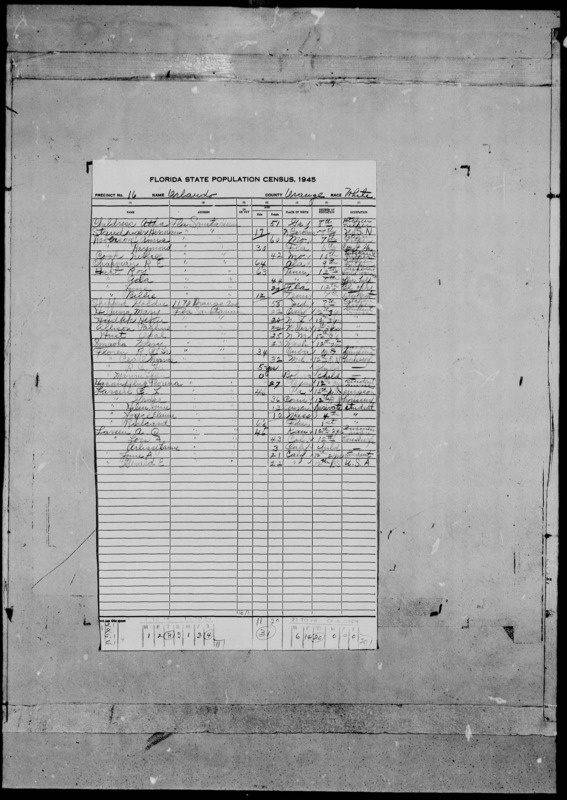 “Florida State Census,” 1945, FL, Orange, Orlando, Precinct 15 A, 8, 124, https://familysearch.org/pal:/MM9.1.1/MNFR-3PN. 2054. “Gerald E Larson,” Find-A-Grave, https://www.findagrave.com/memorial/112843637, 112843637. 2055. “Jeanette M Larson,” Find-A-Grave, https://www.findagrave.com/memorial/112829511, 112829511. 2056. 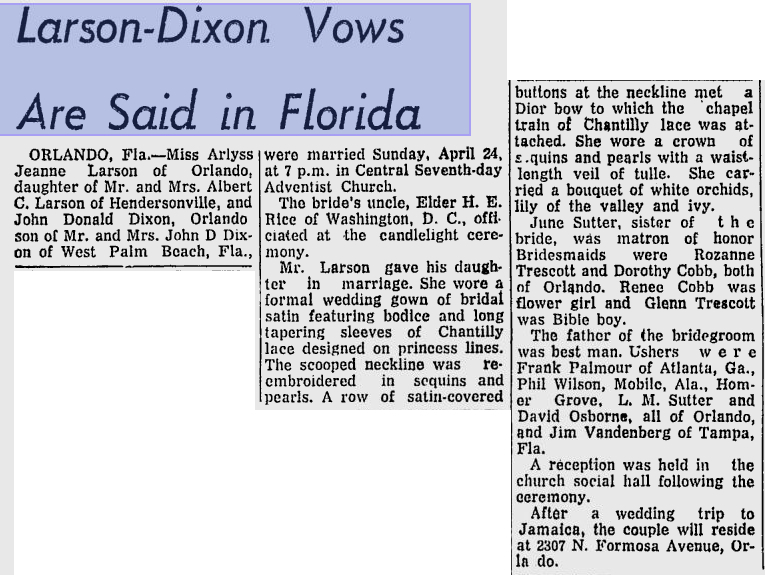 “Larson-Dixon Vows Are Said in Florida,” John Donald Dixon and Arlyss Jeanne Larson, The Times-News, Hendersonville, NC, April 23, 1966, 10, http://news.google.com/newspapers?id=jEMaAAAAIBAJ&...mp;pg=4587%2C1815248. ORLANDO, Fla.--Miss Arlyss Jeanne Larson of Orlando, daughter of Mr. and Mrs. Albert C. Larson of Hendersonville, and John Donald Dixon, Orlando son of Mr. and Mrs. John D. Dixon of West Palm Beach, Fla., were married Sunday, April 24, at 7 p.m. in Central Seventh-day Adventist Church. The bride’s uncle, Elder H. E. Rice of Washington, D. C., officiated at the candlelight ceremony. Mr. Larson gave his daughter in marriage. She wore a formal wedding gown of bridal satin featuring bodice and long tapering sleeves of Chantilly lace designed on princess lines. The scooped neckline was re-embroidered in sequins and pearls. A row of satin-covered buttons at the neckline met a Dior bow to which the chapel train of Chantilly lace was attached. She wore a crown of sequins and pearls with a wastelength veil of tulle. She carried a bouquet of white orchids, lily of the valley and ivy. June Sutter, sister of the bride, was matron of honor. Bridesmaids were Rozanne Trescott and Dorothy Cobb, both of Orlando. Renee Cobb was flower girl and Glenn Trescott was Bible boy. The father of the bridegroom was best man. Ushers were Frank Palmour of Atlanta, Ga., Phil Wilson, Mobile, Ala., Homer Grove, L. M. Sutter and David Osborne, all of Orlando, and Jim Vandenberg of Tampa, Fla.
A reception was held in the church social hall following the ceremony. After a wedding trip to Jamaica, the couple will reside at 2307 N. Formosa Avenue, Orlando. 2057. “Alvin Jake Eberhardt,” Find-A-Grave, https://www.findagrave.com/memorial/108354217, 108354217. 2058. David Franklin Lehman, “Ontario Births, 1869-1912,” December 2, 1888, Chaffey, Muskoka, Ontario, Canada, Registration Number: 501867-GS Film number: 1871040-Digital Folder Number: 004656925-Image Number: 01492, https://familysearch.org/pal:/MM9.1.1/VNG6-PM5. 2059. “Canada Census, 1901,” 1901, ON, Muskoka & Parry Sound, March 31, 1901, 16. 2060. Canadian Great War Project, “Private George Alexander Lehman,” http://www.canadiangreatwarproject.com/searches/soldierDetail.asp?ID=160082. 2061. 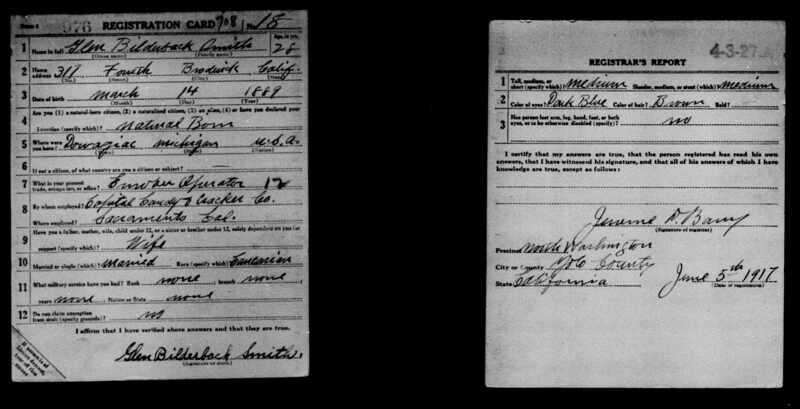 Canadian Great War Project, “Private Marshel C Lehman,” http://www.canadiangreatwarproject.com/searches/soldierDetail.asp?ID=160099. 2062. Canadian Great War Project, “Corporal Harry Campbell Lehman,” http://www.canadiangreatwarproject.com/searches/soldierDetail.asp?ID=49573. 2063. “Fred E Habenicht,” Find-A-Grave, https://www.findagrave.com/memorial/31850103, 31850103. 2064. “Obituary,” Michael M Haflich Sr, Mail Tribune, Medford, OR, November 9, 2012. Michael M. Haflich Sr., 78, of Central Point, Ore. passed away Friday, November 2, 2012. Micheal was born July 6, 1934, in Stockton, Calif. to parents John and Clara (Lyons) Haflich. He is survived by his wife, Gene Gould; four sons; three daughters; three sisters; seven brothers; 12 grandchildren, and 11 great-grandchildren. He was preceded in death by two sons; one daughter; and two brothers. A memorial service will be held at 11:00 a.m. Saturday, November 10, 2012, at Conger-Morris Central Point. In lieu of flowers, memorial contributions can be made to the Arthritis Foundation. 2065. “Clara F Haflich,” Find-A-Grave, https://www.findagrave.com/memorial/89079047, 89079047. 2067. John L Haflich and Clara M Lyons, “California, Divorce Index, 1966-1984,” May 1968, San Joaquin County, CA, https://familysearch.org/pal:/MM9.1.1/VPB8-YVG. 2068. “Lorna Doone Craig Sturm,” Find-A-Grave, https://www.findagrave.com/memorial/122541498, 122541498. 2069. “Norman Albert Sturm, Sr,” Find-A-Grave, https://www.findagrave.com/memorial/39001541, 39001541. 2070. 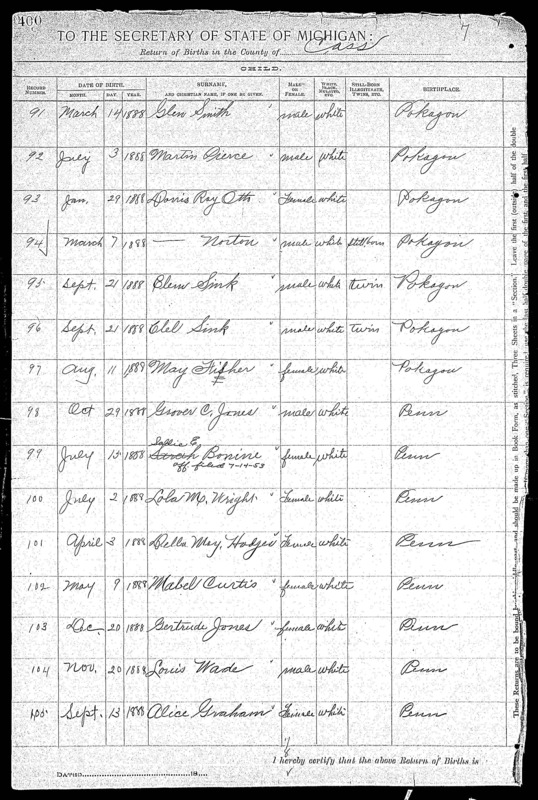 Ruby Christine West, “England and Wales, Birth Registration Index, 1837-1920,” October - December, 1900, Strood, Kent County, England, Volume: 2A-Page: 573-Line Number: 31, https://familysearch.org/pal:/MM9.1.1/2FH5-99L. 2071. “Obituary,” Daniel Tuttle Thornton, San Joaquin County, CA, https://familysearch.org/pal:/MM9.1.1/VR8G-WBJ. 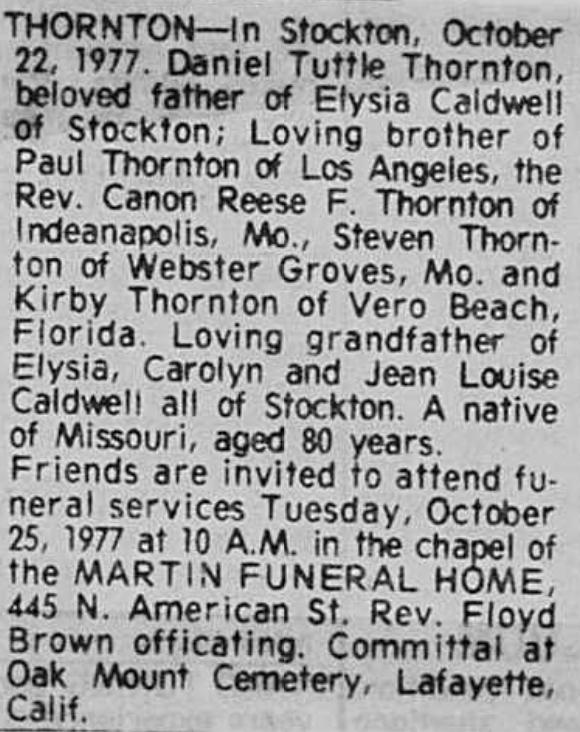 Thornton--In Stockton, October 22, 1977. Daniel Tuttle Thornton, beloved father of Elysia Caldwell of Stockton; Loving brother of Paul Thornton of Los Angeles, the Rev. Canon Reese F. Thornton of Indeanapolis (sic), Mo., Steven Thornton of Webster Groves, Mo. and Kirby Thornton of Vero Beach, Florida. Loving grandfather of Elysia, Carolyn and Jean Louise Caldwell all of Stockton. A native of Missouri, aged 80 years. Friends are invited to attend funeral services Tuesday, October 25, 1977 at 10 A.M. in the chapel of the MARTIN FUNERAL HOME, 445 N. American St. Rev. Floyd Brown officiating. Committal at Oak Mount Cemetery, Lafayette, Calif.
2072. “Freitas-Race,” Willard Jason Race III and Tori Constance Freitas, The Citizens’ Voice, Wilkes-Barre, PA, October 28, 2012, http://citizensvoice.com/arts-living/people/anniversaries/freitas-race-1.1392448. Tori Constance Freitas and Willard Jason Race III were united in marriage April 8, 2012, in Bloomingdale, N.Y. 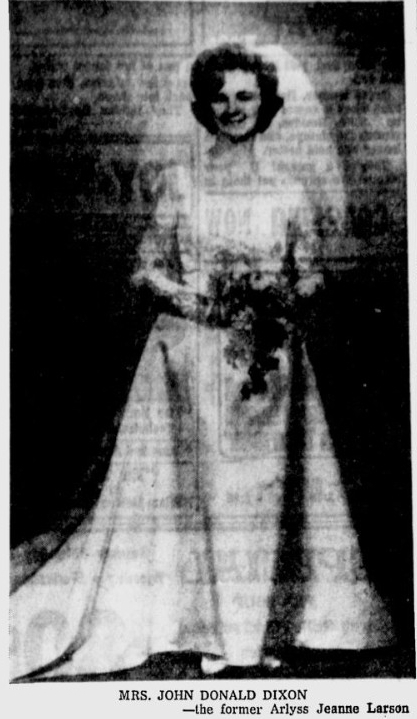 The bride is the daughter of Constantino Freitas and Jolleen Kay Freitas, Fort Fairfield, Maine. She is the granddaughter of Queenie Emily Dorvall and the late Clarence George Dorvall, Minnie Freitas and Joseph Freitas. The groom is the son of Willard J. Race Jr. and Sandra L. Race of Dallas. He is the grandson of Willard J. Race Sr. and the late Willis Dean Johnson; Dorothy Ruth Houser Johnson and Joan Marie Davis Race. The couple was married in a private ceremony at their home in Bloomingdale, N.Y., and they celebrated with family and friends in July at the home of the groom's parents. The bride is a graduate of Limestone High School, Maine. She earned a bachelor's degree in animal and pre-veterinary sciences from the University of Maine at Orono and a Ph.D. in function genomics from North Carolina State University. She is employed by Myriad-RBM as a senior scientist in Assay Development. The groom is a graduate of Dallas High School. He earned an associate degree in applied science in fish and wildlife management from Paul Smiths College, New York. He is the proprietor of Efficiency Electric and a lessor in the Lake Placid, N.Y., area. 2073. “Ruby C Sturm,” Find-A-Grave, https://www.findagrave.com/memorial/120710709, 120710709. 2074. “Licensed to Wed,” Frank McKey and Queenie Thornton, The Fresno Bee the Republican, Fresno, CA, November 27, 1936, 22. McKey-Thornton--In Reno, November 24th, to Frank McKey, 21, and Queenie Thornton, 18, both of Mariposa. 2075. “Obituary,” Clarence George Dorvall, Daily News, Red Bluff, CA, August 4, 2012. Clarence Dorvall of Corning passed away July 31, 2012 at the Red Bluff Healthcare Center, with his family at his side. He had been in poor health for some time. Clarence was born Sept. 20, 1920 in Ketchikan, Alaska to Clarence and Grace Thomas Dorvall. Later they moved to Port Angeles, WA where Clarence graduated from high school. He worked at various jobs including Boeing Aircraft before joining the U. S. Navy during World War II. He served as a Boatswain's Mate First Class. He served in the South Pacific and was Honorably Discharged after three years. He then moved to Chico, CA and joined the Cement Masons Union Local 400. He worked as a cement mason for thirty years. He moved to Corning in 1972 when he married the former Bobbie Jean Russell, his wife of forty years. Clarence was a life time member V.F.W. Chico #1555, Olivet Masons F & M of Corning, where in 1989 he was honored with the Hiram Award. He was also a member of Red Bluff Elks #1250, and a former member of Ben-Ali Shrine Club. Survivors include wife Bobbie Jean of Corning; step-daughter Andrea White (Ron) of Corning; step-son Bruce Russell (Mary) of Redding; four grandchildren and two great grandsons. He is also survived by sisters Donna Frazer and Edna O'Neill of Port Angeles, WA. and brother William Dorvall of Magalia, CA. He was preceded in death by his parents, sister Edna O'Neill, brother Robert Dorvall, step-son Greg Russell, and numerous nieces and nephews. Clarence loved his dogs, country music and western movies. A private family service will be held in his honor. He will be dearly missed. 2076. 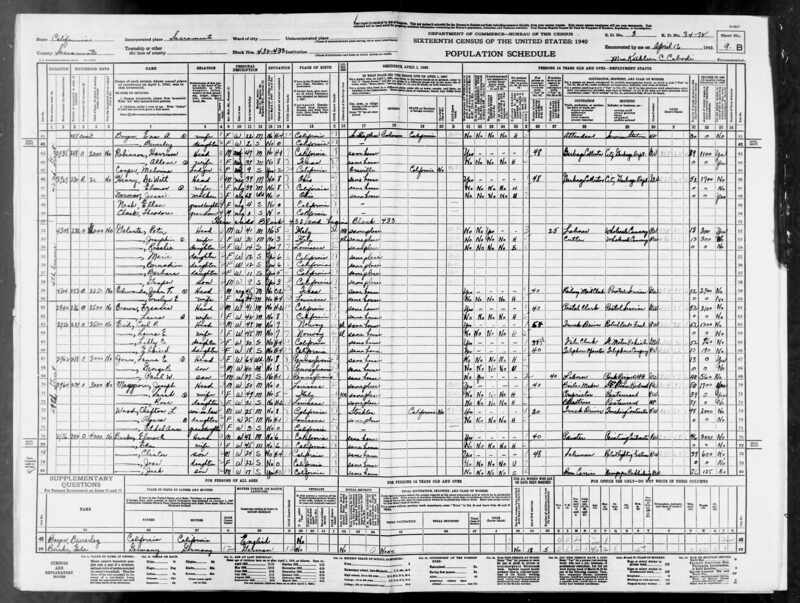 “United States Census: 1940,” Bureau of the Census, US Dept. of Commerce, United States of America, 1940, AZ, Cochise, Douglas, Supervisorial District 2, Ward 5, April 5, 1940, Rich D Elliott, 4A, 3, 2-28, T627, 100, 703. 2077. Jess A McKey and Patricia F Higgins/Kauti, “California, Marriage Index, 1960-1985,” November 19, 1983, Stanislaus County, CA, https://familysearch.org/pal:/MM9.1.1/V6DK-RTR, https://familysearch.org/pal:/MM9.1.1/V6J7-YPS. 2081. “Obituary,” Patricia Faye McKey, Appeal Democrat, Marysville, CA, July 25, 2013. Born 7-25-1941 in Superior, Wisc. passed into the arms of her Savior on 7-20-2013. After working for & retiring from Del Pero Mondon Meat Co, she enrolled in the nurse's course at Yuba College and graduated as an LVN. Pat continued schooling while working at Rideout Hospital and earned her license as an RN. Pat loved to travel and was an ardent adventurer. From diving on coral reefs in some distant island to hiking in the Sierra Nevada Mountains. She was most happy when held in the hands of Mother Nature. Pat enjoyed the peaceful beauty of home and new friends she met while taking painting and art class. She is survived by husband Jess, daughter Donna Kauti, son Dale Kauti, step-daughter Lisa Hemm, 7 grandchildren and 4 great- grandchildren. A Celebration of Life Service is pending. 2082. “Patricia Faye McKey,” Find-A-Grave, https://www.findagrave.com/memorial/114243683, 114243683. 2083. “In Memory of Todd (toddie) Anthony Potter,” http://www.christianmemorials.com/tributes/todd-potter/. 2085. 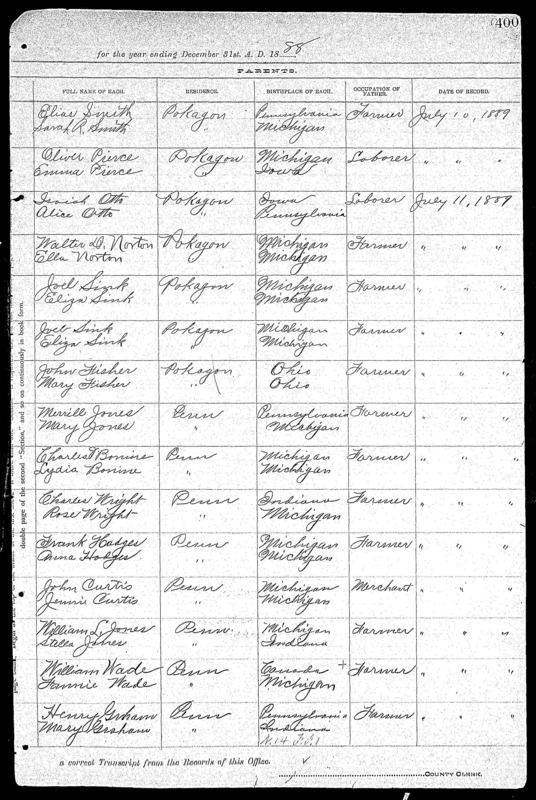 Glen Smith, “Michigan, Births, 1867-1902,” March 14, 1888, Pokagon, Cass County, MI, USA, https://familysearch.org/pal:/MM9.1.1/NQ8H-3FJ. 2086. “S Rose Smith,” Find-A-Grave, https://www.findagrave.com/memorial/15674956, 15674956. 2087. “Elias Smith,” Find-A-Grave, https://www.findagrave.com/memorial/15674951, 15674951. 2088. 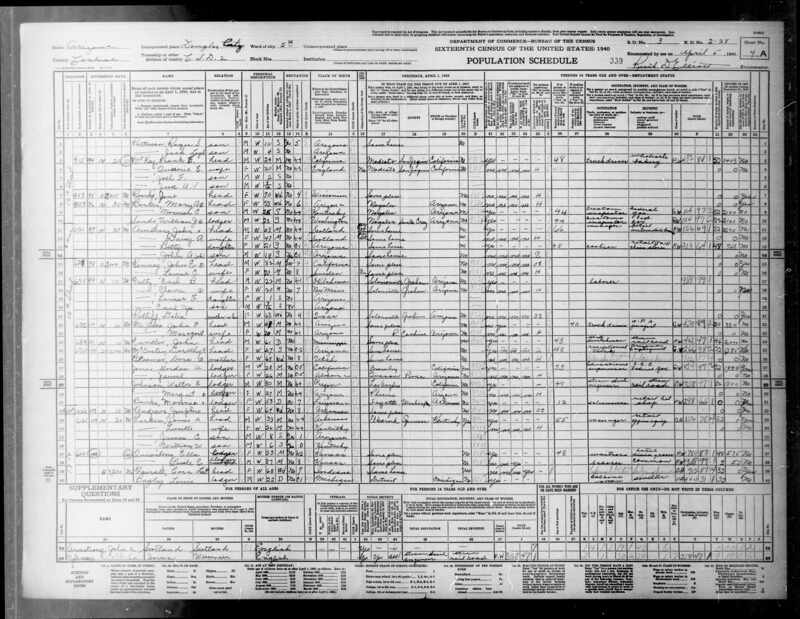 “United States Census: 1920,” Bureau of the Census, US Dept. of Commerce, United States of America, 1920, CA, Sacramento, Sacramento, Precinct 39, January 6, 1920, Anne S Calhoun, 5A-5B, 3, 128, T625, 127, 47. 2089. 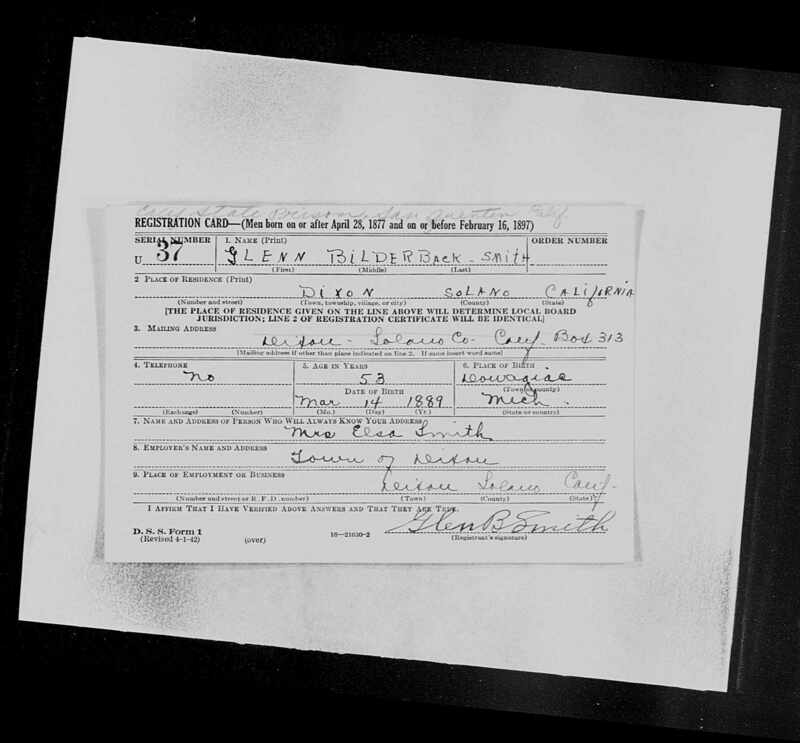 World War I, 1917, California, 976, Smith, Glen Bilderback, “World War I Selective Service System Draft Registration Cards,” June 5, 1917, North Washington, Yolo County, CA, Affiliate Publication Number: M1509-GS Film number: 1544472-Digital Folder Number: 005241920-Image Number: 03777, https://familysearch.org/pal:/MM9.1.1/KZKZ-HKW. 2090. 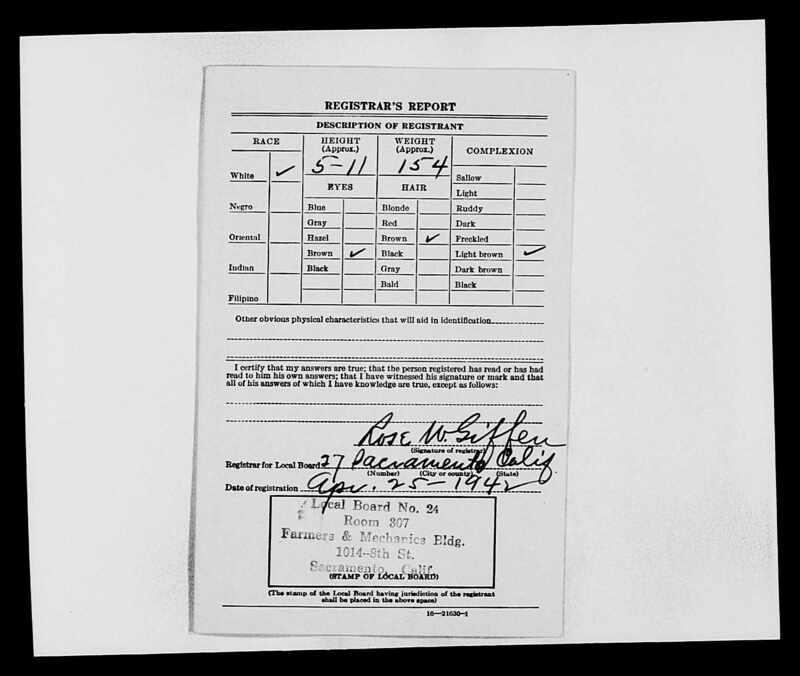 World War II, 1942, California, U37, Smith, Glenn Bilderback, “World War II Draft Cards (4th Registration) for the State of California,” April 25, 1942, Fairfield, Solano County, CA, https://familysearch.org/pal:/MM9.1.1/V4DS-1XS. 2091. “Charlotte E “Lottie” Hoffman Burke,” Find-A-Grave, https://www.findagrave.com/memorial/30849401, 30849401. 2092. “Francis Albert Burke,” Find-A-Grave, https://www.findagrave.com/memorial/30849417, 30849417. 2093. 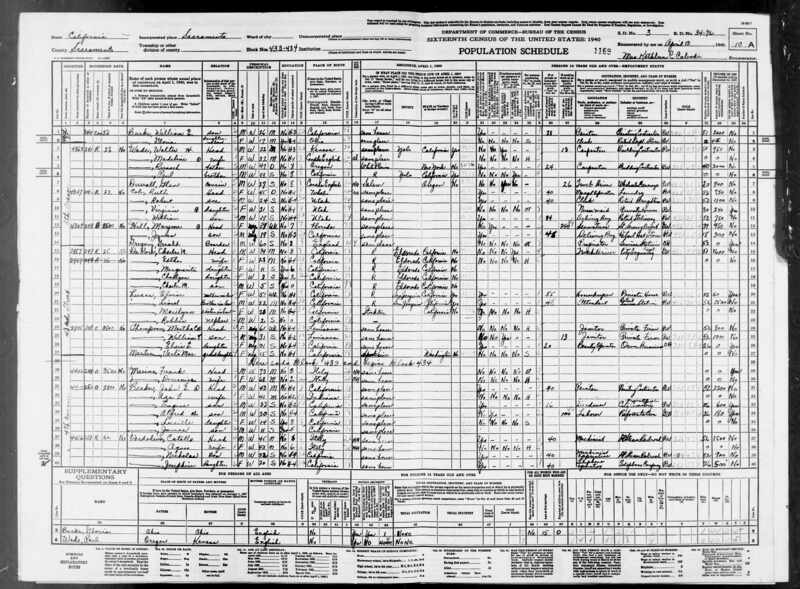 “United States Census: 1940,” Bureau of the Census, US Dept. of Commerce, United States of America, 1940, CA, Sacramento, Sacramento, April 12, 1940, Mrs. Kathleen C Cabodi, 9B-10A, 3, 34-72, T627, 283, 162. 2094. “Jack A Burke,” Find-A-Grave, https://www.findagrave.com/memorial/114501529, 114501529. 2095. “Obituary,” Claire Antoinette McGuire, Lincoln News Messenger, Lincoln, Placer County, CA, April 29, 2009. Claire Antoinette Mc Guire born March 10, 1914 in Broderick, Calif., passed away in Auburn Calif., at the age of 95. Claire resided in Auburn for 34 years. She is survived by her son, John Joseph Mc Guire SR.; sister, Doris Blankenship; (daughter's, Carol, Debbie and loving family); grandson's, John Joseph Mc Guire JR., (wife Laura); Kevin Patrick Mc Guire; and great-grand children, Trevor Patrick Mc Guire, Johnny Joseph Mc Guire III, Sophia Claire Mc Guire and good friend, Kathleen O'Brien. Claire lived a long and healthy life and will be remembered for her elegance, her smiles and her loving ways. "We will miss her greatly." Catholic Mass will be held at St. Mary's Catholic Cemetery, 6700 21st St. Sacramento, CA on May 6, 2009 at 11 a.m.
2096. 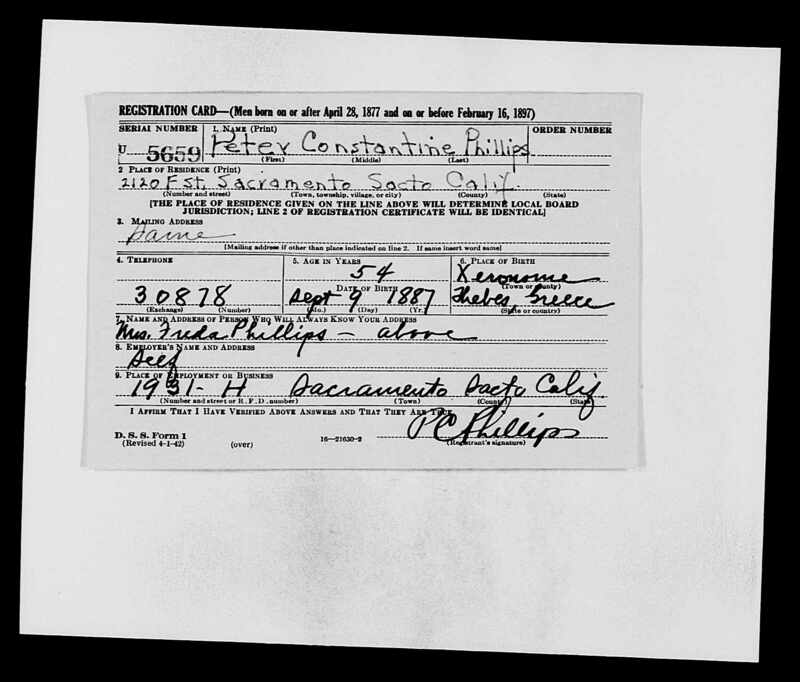 World War II, 1942, California, U5659, Phillips, Peter Constantine, “World War II Draft Cards (4th Registration) for the State of California,” April 25, 1942, Sacramento, Sacramento County, CA, https://familysearch.org/pal:/MM9.1.1/V4DS-1XS. 2097. 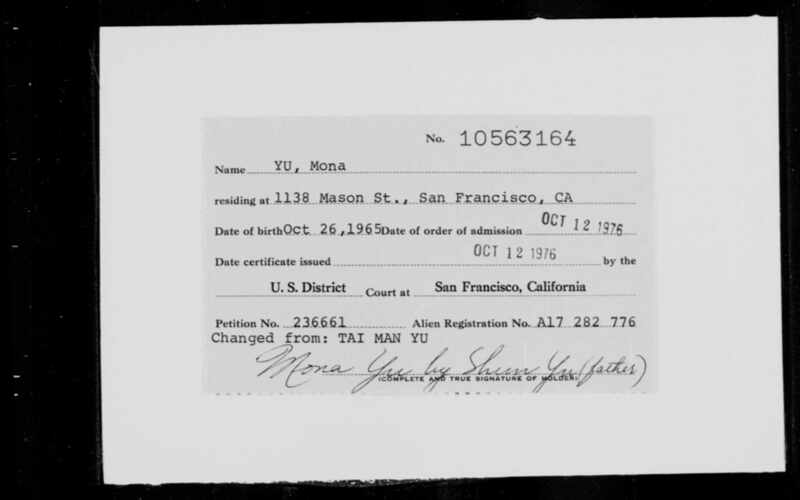 Mona Tai Man Yu, “California, Northern U.S. District Court Naturalization Index, 1852-1989,” October 12, 1976, San Francisco, San Francisco County, CA, 10563164, Affiliate Publication Title: Index to Naturalization in the U.S. District Court for the Northern District of California, 1852-CA 1989, Affiliate Publication Number: NARA M1744-Affiliate Film Number: 163-Digital Folder Number: 004640453-Image Number: 01987, https://familysearch.org/pal:/MM9.1.1/K8Z7-55D. 2098. “Helena K Larson Englund,” Find-A-Grave, https://www.findagrave.com/memorial/45286001, 45286001. 2099. “Nels Arvid Englund,” Find-A-Grave, https://www.findagrave.com/memorial/59743260, 59743260. 2100. “Hannah Amanda Peterson Englund,” Find-A-Grave, https://www.findagrave.com/memorial/59743289, 59743289.